In this file photo, Hillary Rodham Clinton answers questions at a news conference at the United Nations, Tuesday, March 10, 2015. The State Department said it doesn't intend to make public roughly 55,000 pages worth of emails that belong to Democratic presidential candidate until January 15, 2016. Hillary Rodham Clinton is making stops in Rhode Island and Massachusetts to raise money for her Democratic bid for president. Clinton is scheduled to first headline a fundraiser in Newton, Massachusetts, according to the Boston Globe. The event will take place at the Chestnut Hill home of Margot and Jonathan Davis. One person who received the invitation told the Globe that the fundraiser is requesting $2,700 per person. Clinton will attend another fundraiser Wednesday afternoon and early evening in East Greenwich, Rhode Island at the home of Democratic activist Mark Weiner, who is hosting the event with former Providence Mayor Joseph Paolino. Tickets started at $1,000 apiece. 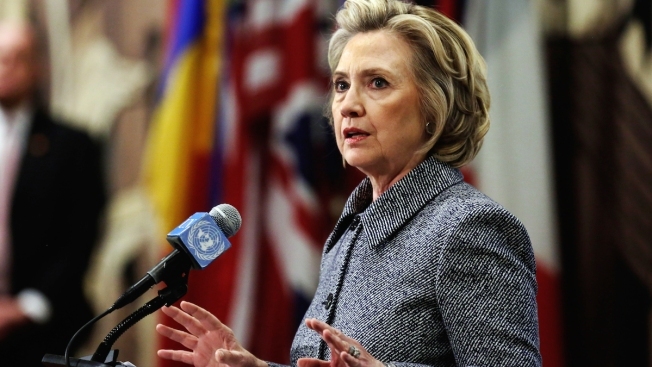 The former secretary of state and senator is the front-runner for the 2016 Democratic nomination. Former Rhode Island Gov. Lincoln Chafee is also in the Democratic field, along with U.S. Sen. Bernie Sanders of Vermont and former Maryland Gov. Martin O'Malley.